The 2018/19 NHL regular season is now in the history books, but headlines were still being written until the final buzzer sounded on the very last game. 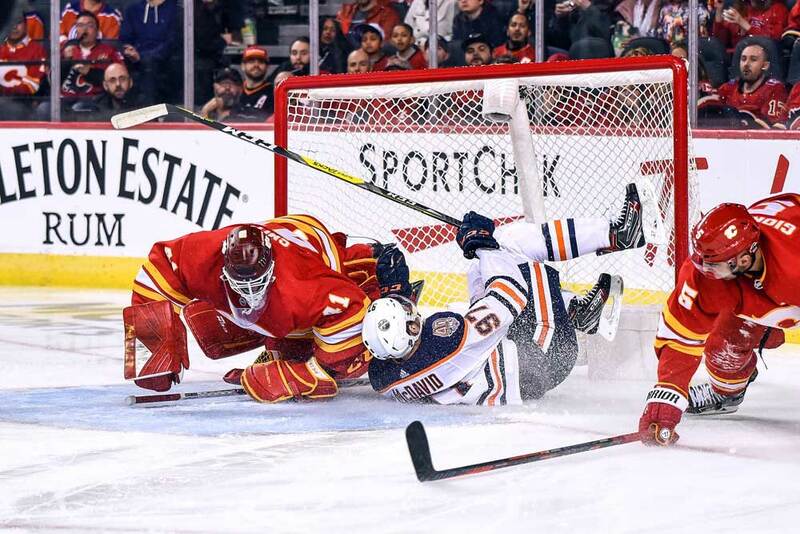 The Edmonton Oilers’ nightmare campaign saw them miss the playoffs yet again and star center Connor McDavid suffered what appeared to be a serious knee injury in their season-ending 3-1 home win over the Calgary Flames. McDavid was driving to the net at full speed when his feet were knocked out from under him by Flames’ captain Mark Giordano. The two-time Hart winner was helped to the dressing room and left the rink on crutches. Fortunately, X-rays proved negative, but McDavid was scheduled to undergo an MRI to see if there is any ligament damage. McDavid’s skating speed was estimated at 25 miles per hour on the play and the injury was similar to the one Steven Stamkos of the Tampa Bay Lightning suffered in November of 2013 when he broke his leg. On a brighter note, Montreal Canadiens’ rookie Ryan Poehling made a name for himself with an unforgettable performance in his NHL debut. Poehling scored a hat trick in a 6-5 home win against the Toronto Maple Leafs with a game for the ages. The 20-year-old tied the contest with 2:31 minutes to go and then added to the dramatics by notching the shootout winner. Poehling is the first Canadiens’ player to score three goals in his first NHL game since Alex Smart back in 1943. He’s the third Hab to post three goals in his debut in franchise history with Joe Malone holding the record with five goals way back in 1917 in the NHL’s very first season. Poehling, who hails from Lakeville, Minnesota, was drafted in the first round with the 25th overall pick in 2017 and scored eight goals and 23 assists this season with St. Cloud State University in the NCAA. He also banged in five goals and added three assists in seven contests for the USA at this year’s World Junior Championships. There was also some news out of Sunrise, Florida as the Panthers’ general manager Dale Tallon announced head coach Bob Boughner and his assistant Paul McFarlane had been fired shortly after the season came to an end. Boughner was with the club for the past two seasons and still had one year to go on his contract. The Panthers missed the playoffs by a single point in 2017/18 and failed to make them this year by falling 12 points short. The club has made the playoffs just twice in the past 18 seasons and haven’t won a postseason series since 1995/96. The 48-year-old Boughner posted an 80-62-22 record with Florida in his first NHL head-coaching stint. The team ranked ninth in the league in goals for this season with four players tallying at least 28 goals. They owned the second-best power-play along with the 10th-best penalty-killing unit, but were ranked 28th in goals against. Recapping the just completed season, Washington Capitals’ sniper Alexander Ovechkin managed to hang on to the goal scoring lead and finished the season with 51. He won the Rocket Richard Trophy for a league record eight times and finished the campaign with one more goal than Leon Draisaitl of the Edmonton Oilers, who was the only other player to reach 50 this year. Ovechkin is also the first player to score at least 45 goals in 10 NHL seasons. As far as the Art Ross Trophy is concerned, Nikita Kucherov of the Tampa Bay Lightning led the league in scoring with 128 points on 41 goals and 87 assists. Connor McDavid was next with 41 goals and 75 assists for 116 points. Kucherov also led the league in assists with McDavid ranking second. Brayden Point of Tampa led the league with 20 power-play goals with teammate Steven Stamkos coming second at 19. Kucherov posted the most power-play points at 48 with Stamkos’ 40 ranking second. Michael Grabner of the Arizona Coyotes led the league in shorthanded markers with six with Mark Jankowski of the Calgary Flames next at five. They were also ranked one and two in shorthanded points with nine and eight respectively. Phil Kessel of the Pittsburgh Penguins scored 10 game-winning goals in 2018/19 to lead the league with Gabriel Landeskog (Colorado Avalanche), Brad Marchand (Boston Bruins) and Connor McDavid notching nine apiece. Dylan Larkin of the Detroit Red Wings and Artemi Panarin of the Columbus Blue Jackets scored the most overtime goals with four each. Twelve other players had three. Calgary Flames’ captain Mark Giordano, who’s now 35 years old, posted a plus-39 rating to lead the league with fellow blue liner Ryan McDonagh of Tampa coming second at plus-38. At the other end of the scale, Buffalo Sabres’ rearguard Rasmus Ristolainen was a minus-41 and former Norris Trophy winner Drew Doughty was minus-34. Brent Burns was the top scoring defenseman with 83 points while Giordano notched 74. Morgan Rielly of the Toronto Maple Leafs was the only D-man to score 20 goals and he led the league. Burns also led defenders in assists with 67 while Giordano and John Carlson of the Washington Capitals had 57. Elias Pettersson of the Vancouver Canucks led rookies in goals, assists and points with 28, 38 and 66 respectively in 71 games. Sabres defenseman Rasmus Dahlin, who was the number one overall draft pick last year came second with 44 points on nine goals and 35 helpers. As far as the goaltenders were concerned, Andrei Vasilevskiy of Tampa posted the most wins at 39 while Sergei Bobrovsky of Columbus had 37. Ben Bishop of the Dallas Stars had the best save percentage at 93.4 in 46 games while Robin Lehner was 93.0 in 46 appearances. Rookie Jordan Binnington of the St. Louis Blues had the best goals-against average at 1.89 in 32 games while Bishop was 1.98. Bobrovsky led the way in shutouts with nine and Marc-Andre Fleury of the Vegas Golden Knights had eight.